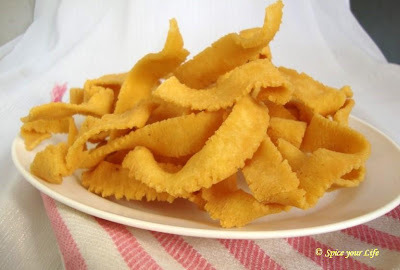 Spice your Life: Ribbon Pakoda ~ Treats for Indian Festivals! 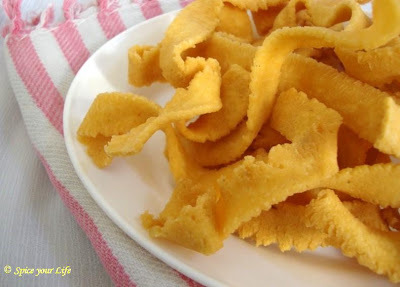 Ribbon Pakoda ~ Treats for Indian Festivals! As a child I always remember looking forward to this time of the year. The many festivals that are celebrated during these months are so many. As such there there is no dearth for festivals in Hindu custom and every festival is celebrated with much enthusiasm. Starting with Navaratri to Deepavali, the celebrations just go on. Deepavali or Diwali, might top the list. The reason or rhyme behind the festival is no longer relevant. Now what it all means that is we get rid of bad things and welcome new thoughts and so on. For a child, I am sure food plays a vital role in colouring their mind about each festival and mine was no different. Amma made different dishes specific for each festival. But for deepavali, these are must on the list. When I attempted to make something else, I also managed to make these delicious Ribbon pakoda, one of my favorite snacks. Until I did, I always assumed its quite tough. As all traditional savories of Indian cuisine. While I have always helped with making the dishes, this one I have never even helped. Somehow back home from school, Amma would have it all ready for us. So I have only remembered eating these endlessly. But after making them for the first time, I really wonder why I haven't attempted till now. Though this dish works out best as the easiest dish to take care of the remaining ingredients. Its lovely to do it on its own too. And best of all it got over within hours of making it. Kids absolutely loved it and it was really so crunchy and delicious. I relived my childhood days enjoying a bite that I could manage for myself. This year I am planning to recreate some of those treats I enjoyed as a kid and will try to record all during these few months. Making the Rice flour at home was first thing that helped me in making this delicious snacks. please refer this basic recipe to know how I made the Rice flour at home. In a wide bowl, take the rice flour, besan, fried gram flour (Pottukadai, Pappulu), salt and butter. Mix all the dry flour well and slowly add the water just enough to get a pliable dough. It should not be very loose though. Heat a kadai with hot. Once its hot, simmer to medium flame. 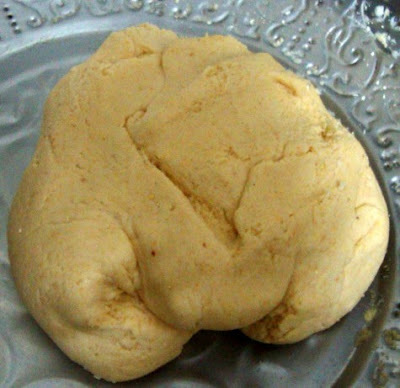 Divide the dough into balls, fill the muruku achu and press over the hot oil. Since the dough is smooth, it will easily slide into the oil. Cook over medium flame to ensure equal cooking on all sides. When its cooked and it turns golden colour, remove and allow to cool a bit. Do make these and enjoy. This goes for my Kid's Delight event!